Sabine Contreras is originally a native of Germany and moved to the U.S. in 1999, after meeting her husband. They live on the West Side of Los Angeles, California and share their home with Jack Russell Terrier Dax and Domestic Shorthair cat Trouble. Involved with dogs and dog related activities for over 35 years, Sabine is focused on natural, preventive dog care as well as canine nutrition and has accumulated experience in these fields through thousands of hours of independent research and academic study. Sabine’s experience in animal care is not limited to dogs though, but also includes small pets (mice, rats, guinea pigs), cats, horses, dairy cattle and other livestock. At school in Germany she attended Biology and Chemistry classes for 8 and 6 consecutive years respectively and during her 2 1/2 year professional apprenticeship, nutrition/dietetics was part of the accompanying education, and the final written and oral exams by the state of Baden-Württemberg. After completing coursework in Animal Nutrition, Care, Physiology, Diseases and Parasitology, Sabine earned her certification in Animal Care from the University of Guelph, Ontario, Canada. In her free time, she enjoys digital photography, cooking, reading, camping, hiking, offroading and road trips, especially “off the beaten path”. She also has a lot of fun competing in various dog sports, conformation showing, and hunting with Dax. As one of her larger dog-related projects, Sabine has researched the pet industry in general and commercial dog food specifically since 2000 and is the author of the successful website The Dog Food Project, which is frequently updated with new information. 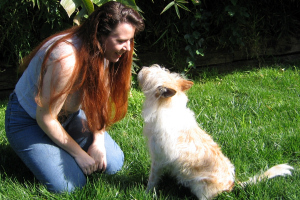 Sabine works with pet owners as well as business clients, rescues, breeders, and veterinarians. Although her focus is on customized feeding plans for individual dogs, she has also formulated diets based on NRC recommendations for small businesses selling fresh prepared foods , some of which recently underwent and passed AAFCO feeding trials. Her writings have been featured in various publications and she is often invited as a guest speaker for local dog club/group functions, a service offered free of charge. Healthy Feeding Programs now enrolling at Better Dog Care! A wave of corporatization is hitting the veterinary industry, but does a one-size-fits-all approach work?